Six of the critically injured were evacuated to the Government Medical College Hospital in Jammu. 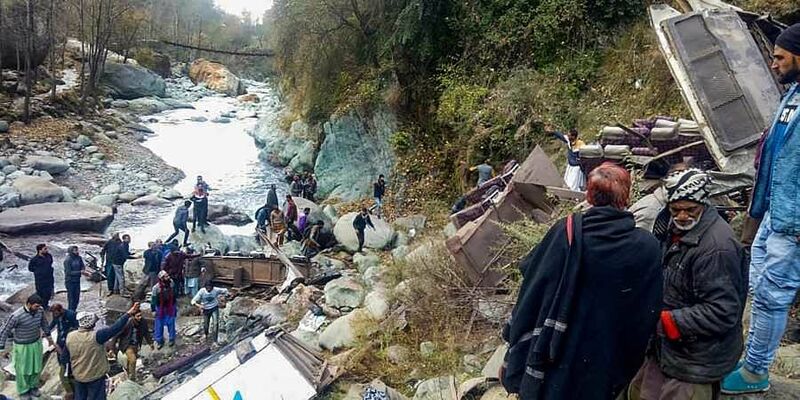 SRINAGAR: At least 14 people including a mother-daughter duo were killed and 13 others were injured on Saturday when a passenger bus skidded off the road and fell into a deep gorge in Poonch district of Jammu and Kashmir. A police official said the bus, which was on its way from Loran to Poonch, met with tragedy at Plera in the Mandi area of Poonch district. He said the driver of the vehicle lost control while negotiating a curve and the bus rolled down a 100-meter gorge. A search and rescue operation was immediately launched by locals, the police and army men. Six people were found dead while 21 others injured were retrieved and shifted to nearby hospitals. Of the injured, eight succumbed to their injuries in the hospital, taking the death toll to 14, added the officer. The dead include 35-year-old Parveen Akhtar and her two-year-old daughter Afia Parveen. Six of the critically injured were evacuated to the Government Medical College Hospital in Jammu. The officer said the police have registered a case and launched an investigation to ascertain the exact cause of the accident.